Avenged Sevenfold will close out the final night (Sunday, October 15) of the second annual Monster Energy Houston Open Air at The Cynthia Woods Mitchell Pavilion presented by Huntsman in The Woodlands, TX. Festival producers Danny Wimmer Presents are very excited to bring the band back to Houston, after dangerous storms and lightning in the area prevented them from playing at last year's event. "We were ecstatic to get the call from Danny Wimmer about playing this year's Houston Open Air," says Avenged Sevenfold vocalist M. Shadows. "We love playing Houston, and after last year's unfortunate weather, we've been looking forward to going back and giving our fans there a much-deserved headlining show. Can't wait to see you all." Prophets of Rage will shift from Sunday night to Saturday, just before Five Finger Death Punch's headlining set. Tom Morello from Prophets of Rage said, "We are excited to remain on Houston Open Air festival. Prophets of Rage wants to thank Avenged Sevenfold for stepping up and taking our Sunday headline slot as we have a personal band conflict that makes us unable to play Sunday. Prophets will now make Houston RAGE AGAIN on Saturday, October 14 and Avenged will do the same on Sunday!" As previously announced, Texas's biggest rock experience is set for Saturday, October 14 and Sunday, October 15 and will feature performances from top rock artists on two stages, also including: Stone Sour, Marilyn Manson, Mastodon, Halestorm, In This Moment, Gojira, Of Mice & Men, Suicidal Tendencies and more. Monster Energy Houston Open Air also features multiple onsite experiences and a Texas-sized food experience underscoring Houston's emergence as a great American food city. Danny Wimmer, Founder of Danny Wimmer Presents, said, "Avenged Sevenfold was the storm that we wanted to close out the first-ever Houston Open Air, but it's not the storm that we got. We've been working for a long time to get Avenged Sevenfold back after last year's weather prevented them from playing. We're excited to have this second chance to bring the spectacle of A7X to the Houston Open Air stage on Sunday night. And Saturday is going to be amazing, with Prophets of Rage joining Five Finger Death Punch, Marilyn Manson, Halestorm, Gojira and more." 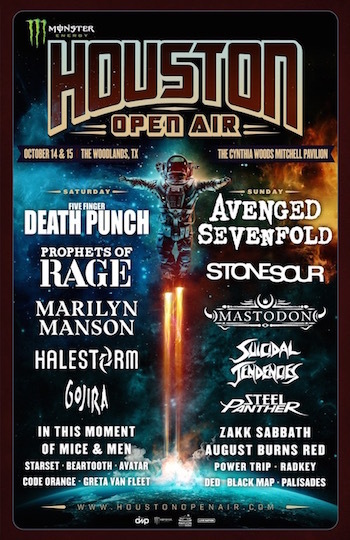 Single day and weekend tickets for Monster Energy Houston Open Air are available at www.HoustonOpenAir.com. Fans are encouraged to buy early and save. Weekend passes start at just $66.66, and single day tickets start at $45.00. VIP upgrades are $40.00 per day or $75.00 for the weekend. Each VIP upgrade pass includes access to The VIP Lounge (located in the Event Center) which features air conditioning, a live video stream of main stage performances, VIP-only restrooms, and dedicated concessions (for additional purchase); a VIP-only entrance into the venue; and a commemorative Monster Energy Houston Open Air laminate. Monster Energy Houston Open Air partner experiences include Monster Energy Experience, Fxck Cancer / Dyin 2 Live, Take Me Home, and more to be announced. The Monster Energy Houston Open Air Eats area will feature a Texas-sized food experience underscoring Houston's emergence as a great American food city. Initial food vendors for Monster Energy Houston Open Air include: Brazilian Bistro, Cousins Maine Lobster, El Guajillo, Texas Taco Depot, and The Grove Truck. Look for many more to be announced. The weekend kicks off with the Official Monster Energy Houston Open Air Pre-Party at Warehouse Live in Houston on Friday, October 13. Between The Buried And Me will be bringing their "Colors" Ten Year Anniversary Tour to Houston, and the night will also feature performances from support acts The Contortionist, Polyphia, and Toothgrinder. Monster Energy Houston Open Air is produced by Danny Wimmer Presents in association with Live Nation.